If you enjoy writing and would like to earnÂ moneyÂ with your articles,Â start here:Â Write for InfoBarrel today! If you’re interested in textiles as an art form but feel you’d like to broaden your knowledge of fiber art techniques to allow you to experiment and take your work on to a new level, you might need some guidance. 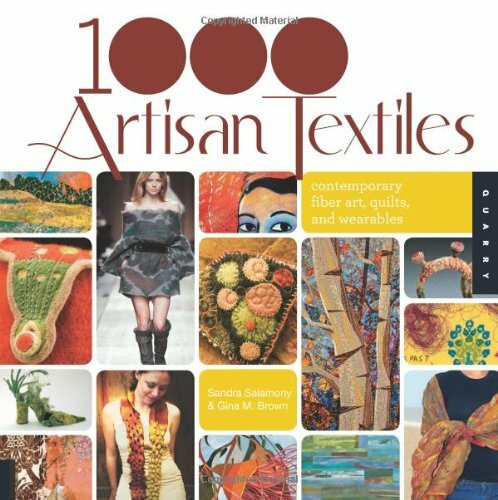 As a contributor to TextileArtist.org, I’ve been introduced to a plethora of fiber art books. Here, I take a look at five of the best. 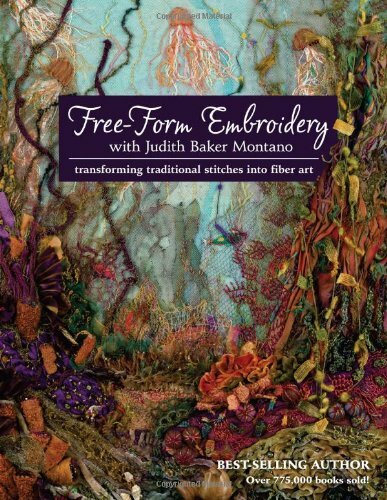 In this authoritative guide, author Judith Baker Montano encourages the reader to widen their knowledge of embroidery and think beyond traditional textile techniques. You will discover how to use thread, fabric and fibers hand in hand with other less conventional embellishments to create beautiful seascapes and landscapes using your favorite photos as inspiration. The author demonstrates methods and fiber art techniques using the principles of fine art and adapting them to textiles. Numerous stitches and combinations of them will empower you to draw with a needle whilst learning new and exciting embroidery skills for creating dimension and perspective, layering and blending shapes. This is a fantastic manual if you’re ready to move on from the odd bit of decorative sewing to creating your own pieces of fiber art. It will be necessary for the reader to have some experience of embroidery and be prepared to experiment with freeform and free-hand stitch to get the most out of this book. A handy supply list - all the materials you’ll need to get started such as specific ribbons, threads, fabrics and yarns. Techniques – from selecting your background fabric to framing the finished piece. Stitch guide – an A-Z of inventive and unusual stitches, from the most basic to advanced. Combining Stitches – a comprehensive guide on how to bring two seemingly unrelated stitches together in perfect harmony to create realistic trees, flowers and shrubs. Encouraging you to ‘think like a painter’ and inspiring you with sumptuous photographs of finished works, this book is certain to get you fired up about fiber art. Judith Baker Montano is a celebrated fiber artist, an international best-selling author, and a respected teacher. She started off as a painter before moving on to quilting and embroidery. A catalogue of stunning contemporary textiles, the volume embraces couture, fashion, interiors, tapestries, quilts and works of art. More a source of inspiration than a how-to of fiber art techniques, the vibrant images show both full-scale works and close-up detailed studies. The range of textile techniques used in the work is wide and far-reaching; mixed media, hand and machine embroidery, batik, decorative stitching, fabric painting, dyeing, appliqué, felt, weaving, and a whole host of surface decoration. What is special about 1,000 Artisan Textiles is the quality of the images. Every piece is beautifully photographed in high definition with clear, bright colours. For easy reference the images are labeled with the name of the artist and brief but pertinent description of the work. One for the coffee-table, you’re bound to return to this manual time and time again when looking for ideas to develop in your own fiber art. Sandra Salamony is a world-renowned book designer. Her love of artisan topics is well documented in a range of books that she has authored, coauthored, and curated. Part fiber art book, part step-by-step guide, Embellishing with anything shows the reader how to make 17 small and manageable fiber art projects. The resultant work is not only beautiful, but in many cases useful too; fabric postcards to send to friends and family on special occasions, artist trading cards to sell your wares, and wall-hangings to brighten up a shabby room, among many others. 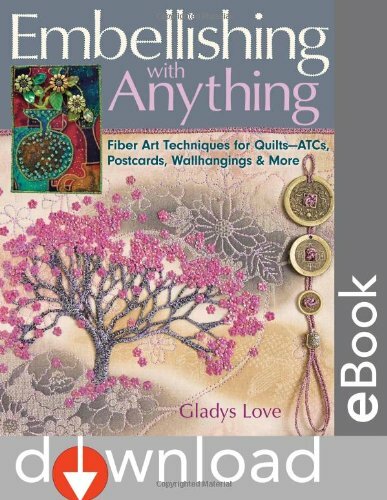 Author Gladys Love teaches you the art of embellishment making use of stitch, beads and found or recycled objects. The great thing about this book is it makes the projects achievable for even the most inexperienced stitcher. Uncomplicated instructions with easy-to-follow diagrams and photos make it seem simple. The creativity behind each item is awe-inspiring. The author utilizes unusual or run-of-the-mill objects and transforms them. Who’d have though that an old wine label could be part of a beautiful work of art, or a beer can? This book takes you beyond the common-place, exploring innovative ways to give an edge to your work, such as making felt beads, fabric painting and unusual stitches. Gladys Love is a secondary school teacher and expresses her creativity through craft and fiber art. 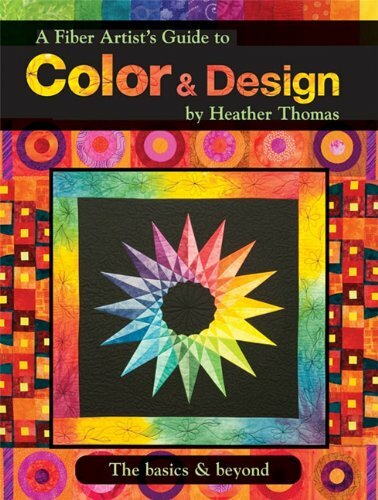 An addition to the Basics and Beyond series, this book is a master class in color and design from teacher, fiber artist and author Heather Thomas. 160 pages guide you through the theories and principles associated with terminology, texture, scale, line, shape, balance, blending and form, as well as teaching you to apply color dominance, value and temperature. Hundreds of images, illustrations and photos will open your eyes to the practicality of the processes discussed. 12 comprehensive workshop lessons are clearly and fully explained and will inspire textile artists to develop their craft and improve their eye for color. A Fiber Artist's Guide to Color & Design takes the reader on a journey of color theory and design principles, which cater specifically for fiber art. The author advocates that color is best learned experientially and encourages you to play, experiment and gain experience as part of the learning process. Working your way through the book, there is a clear logic to the methods and the order in which they appear; quick key boxes will point you towards the most important points raised in particular sections. In what can be a confusing and complicated process, Heather Thomas has made the theories presented easy to understand and opens up the endless possibilities of color. Heather Thomas is a highly experienced quilter and has been teaching fiber art techniques for over 15 years. Bringing together the disciplines of machine stitching, hand embroidery, Stupendous Stitching demonstrates how even the most inexperienced artist in this area can create beautiful pieces of sophisticated textured fabric art that can be used to decorate your home, display on your walls and even accessorize your wardrobe. In just a handful of fun steps, the author shows you how to bring your ideas to life in unique pieces of artwork. The book also encompasses clear guidelines for stitching, giving your work a professional finish and mounting your art. You’ll also find links to useful video tutorials, a wide range of inspirational images and ideas for future projects. What this book does brilliantly is open your mind up to a whole range of new opportunities, particularly when using your sewing machine. Carol Ann Waugh takes you beyond the classic stitches and introduces some innovative designs that you may never have considered. Just a word of warning – many of the stitches and fiber art techniques featured require a computerized sewing machine and won’t be easily achieved on a classic. What is also expertly explained is the use of various thread weights and needle sizes, so it is the perfect guide for the nervous or inexperienced sewer looking to deepen their understanding. The styling of the book might not appeal to everyone, but the information included is priceless and timeless. 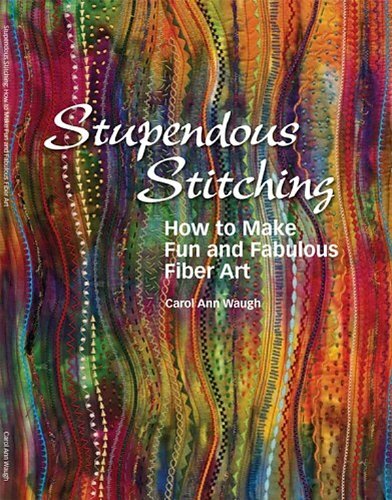 Carol Ann Waugh is the author of the popular book The Patchwork Quilt Design & Coloring Book and is a renowned fiber artist working from Denver.